California is overdue for a great quake, possibly starting along the San Andreas Fault — which stretches from the Salton Sea to Monterey County and beyond. Temblors like the 1994 Northridge quake and the 1989 Loma Prieta quake each killed dozens of people. And the latter temporarily stopped the World Series. Those quakes measured 6.7 and 6.9 on the Richter scale, respectively, but experts now predict a 19 percent chance that a major quake of 7.0 or more will hit the south end of the San Andreas some time in the next 30 years. And the chance of an 8.0-or-larger great quake in the same area is now predicted at 7 percent over the same time span. Such a mega-quake would pack nearly 90 times more energy than the Northridge quake, which jolted Angelenos awake on a January morning, collapsing buildings and crippling major freeways. The 7.1 quake south of Mexico City came less than two weeks after a magnitude 8.1 shocker off the Mexican coast put the nation on edge. With the death toll at more than 200 and pictures of devastation all over the news, California officials sent their condolences, but also wasted no time in using the news as a teachable moment. 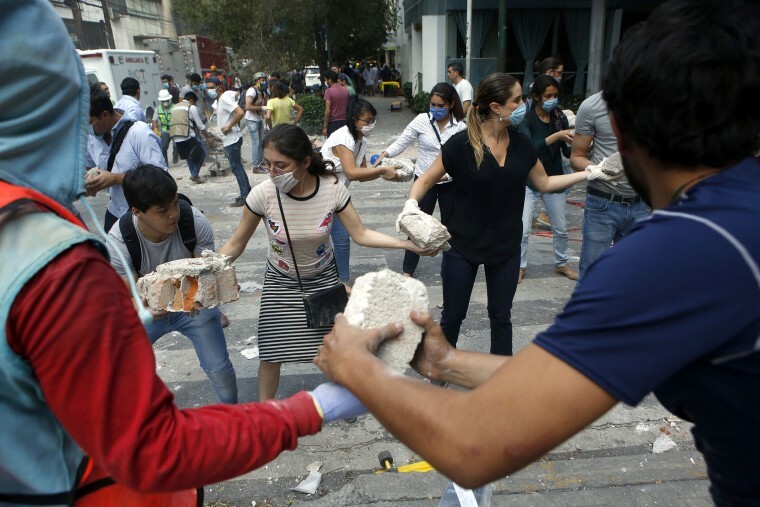 “Mexico quake reminds us: science can tell us what the impact can be but society has to take action to prevent catastrophic damage,” tweeted Lucy Jones, the California seismologist who has become a leading worldwide authority on earthquake preparedness. Residents in earthquake zones are advised to secure heavy objects — like dressers and televisions — to walls. They are also supposed to avoid sleeping beneath mirrors, paintings and other items if they are not securely attached. Aram Sahakian, general manager of the Los Angeles Emergency Management Department, said hurricanes Harvey and Irma — with their flotilla of amateur boaters — also helped demonstrate how crucial volunteers are in responding to major disasters. “The first people to assist you are going to be your family and your neighbors,” said Sahakian. He urged Angelenos to meet with people in the 10 to 20 homes closest to theirs and to begin making plans. Among the first priorities: to identify people who might need special assistance, like children and the elderly and those who require special medical attention, like oxygen and dialysis. A second priority should be planning how to communicate with family and neighbors if phone lines go down. Multiple back-up plans should be laid out in advance, right down to face-to-face meeting places, Sahakian said. Emergency management officials have also upped the amount of water, food and other emergency supplies they recommend be socked away. They used to call for enough supplies to last 72 hours, but now say one week of provisions should be the minimum. Why? Helen Chavez, assistant director of the Los Angeles County Office of Emergency Management, seconded that recommendation and said people especially tend to underestimate how much water they will need. Emergency management officials recommend from one liter to one gallon of water per person and pet, per day. Those who do not have room to store that much water are advised to consult emergency websites on how to use bleach to disinfect water, she said. Those who want more formal preparation training can join a Community Emergency Response Team. The CERT teams take part in mock disaster training and learn about first aid, communication and other skills. One critical preparation factor out of the hands of many Californians, especially renters, is the stability of the buildings where they live. But the state has been steadily improving its seismic safety building codes. In 2015, Los Angeles approved the nation’s most comprehensive earthquake safety retrofitting law. The city reported in June that more than 15 percent of the vulnerable wood-supported apartments buildings had begun strengthening improvements. That is of about 13,500 buildings that have been deemed in need of repair.